Find the products ideal for helping with your pets condition. 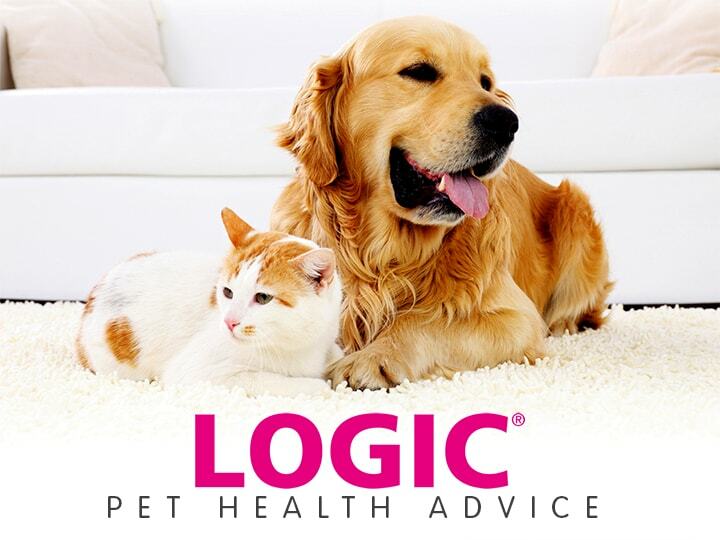 LOGIC® products for helping your pets with a variety of conditions. CEVA® products for helping your pets with a variety of conditions. A series of dental health videos for your pet. A series of articles concerning your pets health. How to keep your ‘furballs’ hairballs under control! Hair today, coughed up tomorrow! Vomiting or ‘coughing up’ hairballs is a common problem in domestic cats. Your cat will spend around 25% of their waking hours grooming, which means that they are regularly ingesting hair. Longhaired cats are more commonly affected than those with short hair. Due to the barbed structure of their tongues, cats ingest a large amount of hair every day. Hair generally passes through the digestive system into their faeces, however some hair can collect in the stomach or small intestine and reach a size that is too large to pass through causing the cat to hack and/or retch until it vomits. The hair that is brought up often appears matted in appearance and hairballs may cause a lack of appetite and/or constipation. In rare cases hairballs can get stuck in the oesophagus or cause intestinal blockages, which may require surgery. Overgrooming resulting in increased hair ingestion can occur for a variety of reasons including flea infestation, pruritus, pain and/or anxiety or altered upper gastrointestinal motility (chronic gastrointestinal disease or increased sympathetic nervous stimulation secondary to chronic pain and/or stress). Regularly brush your cat to decrease the amount of hair that is ingested; ideally longhaired breeds should be groomed daily. After brushing, wiping the cat with a clean cloth removes any loose hairs. Supplements are available to aid passing hairballs. These products are usually based on oils to aid the passing of hair into the faeces. A new product on the market is LOGIC® EaseBall tasty salmon flavoured soft chews. These chews contain natural fish oils to lubricate the digestive tract and enhance the passage of fur through the gut with the added benefit of contributing to a healthy, shiny coat. For the reduction of hairballs, one tasty chew should be fed per day. To assist in removal of existing hairballs, up to four chews should be fed daily until the hairballs are passed. A vet check to make sure there are no underlying medical causes. Assessing the cat’s home environment to consider any additional stress e.g. a new cat in the home, difficult access to resources or a change to the home. Distraction using toys, games or puzzle feeders can decrease the time spent grooming. If you are ever worried about your cat please visit your vet.